WANT TO STEP UP YOUR PERFORMANCE GAME? 2. You can build a community of students who have friends and family of all ages who will come see you perform, and cheer you on. 3. 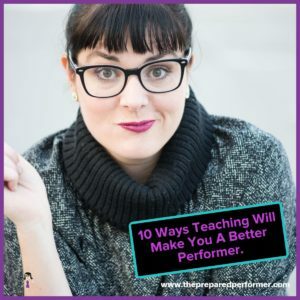 Knowing that your students are in the audience gives you an extra reason to really be your best on the stage. 4. Seeing your students get something that was once crazy difficult for you will remind you that you had to work your booty off to be where you are. 5. Seeing their success will be crazy gratifying without the stress of going through the auditions yourself. 6. When you do go to auditions, you’ll feel a sense of responsibility to THEM to stay focused on your own awesome and you won’t get sucked into the nerves as easily. 7. You’ll be forced to come up with new solutions for performance problems that will not only benefit your students, they will benefit you. 8. You’ll get paid to do what you love, even when you aren’t performing, and you won’t be at a miserable day job wishing you were singing/acting/dancing. 9. You get to determine your own curriculum, hours, and rates which frees you up to take the opportunities that come your way. 10.You will be helping to ensure that the legacy of the goodness that fills you with joy will be passed on to others. PS. Want to grow a Performance Coaching Business that will enhance your Performance Career? 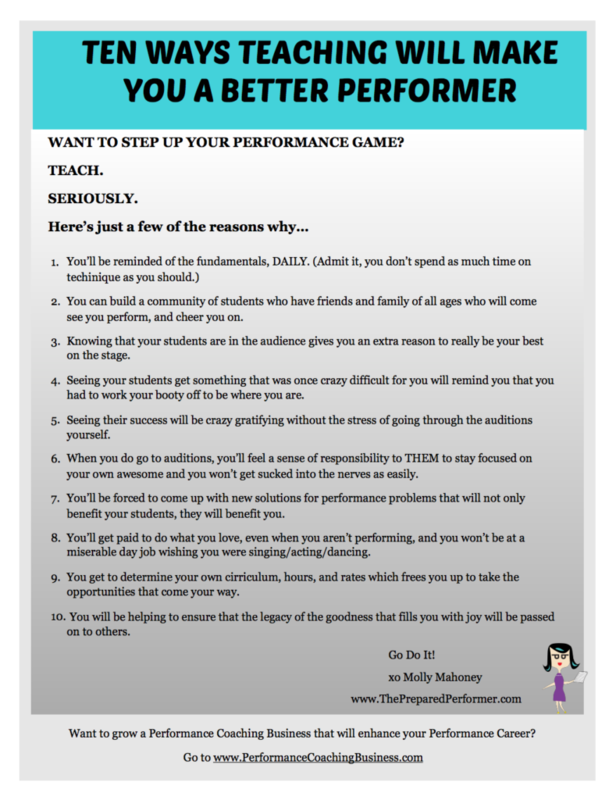 to download our business tool kit for performers. It's a perfect start for building a performance coaching business.